dried thyme, crushed	 4 tsp. red onion, thickly sliced	 2 lb. 2 qt. zucchini, thickly sliced	 56 oz. 3 qt. mushrooms, large	 54 oz. 1 pt. 1. Stir the broth, thyme and black pepper in a large bowl. Brush the vegetables with the broth mixture.2. Lightly oil the grill rack and heat to medium. 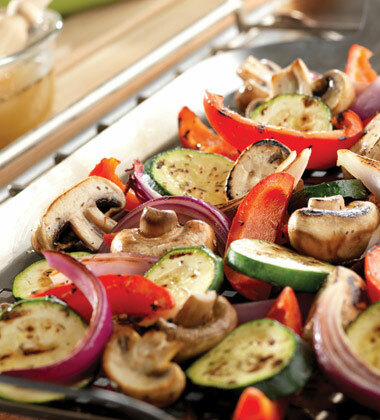 Grill the vegetables for 10 minutes or until tender-crisp, turning over once during grilling and brushing often with the broth mixture.CCP: Hold for hot service at 140 °F. red onion	 2 lb. 2 qt. zucchini	 56 oz. 3 qt. mushrooms	 54 oz. 1 pt. Pair with Firecracker Flank Steak and 1/2 cup of fresh peaches for a meal under 500 calories. 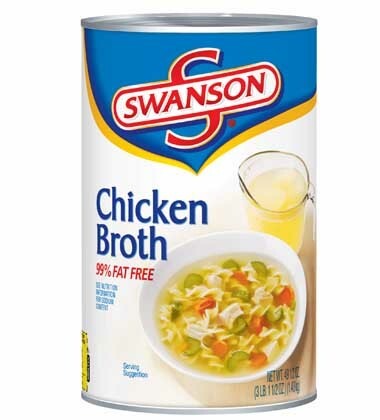 You may substitute Swanson Certified Organic Chicken Broth or Swanson Natural Goodness Chicken Broth. Recipe variations may alter nutrient analysis.